Nothing like getting in at the last minute! I have my last recreation on the last day of the month! My final recreation comes from June 2013's Neon theme. 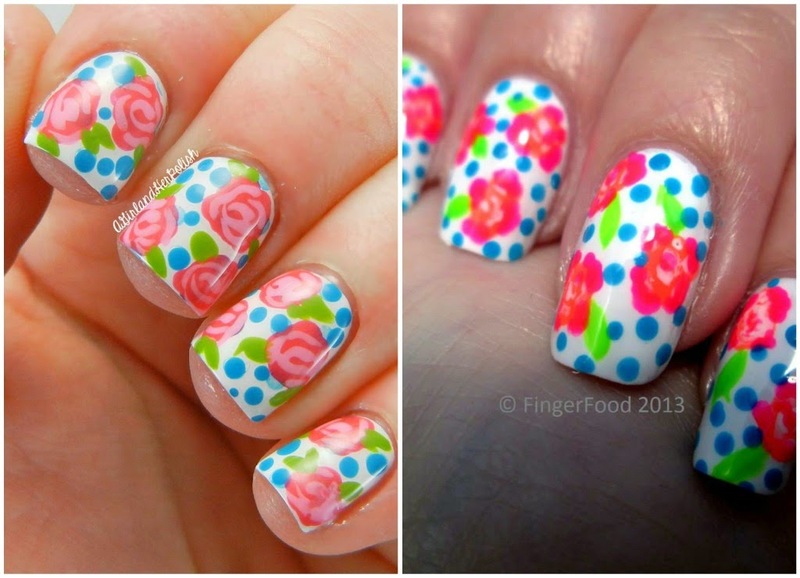 Sam from FingerFood created an amazing rose and dot design that I HAD to recreate! I started with two coats of Purity. I thought I would cheat a little and stamp the dots first. I used Robyn and Shany 214 to add the dots. In the end it wasn't necessary. Using a large dotting tool and Yana, I added the base of my roses. I added my rose accents using Kitridge and a small nail art brush. I used the same nail art brush and Tilda to add my leaves. I added more dots with Robyn. Afterwards I decided that I liked the dots before I added more. If I do this design again I won't add this last step. It has been so fun seeing all the recreated manicures this month! Stop by and see what the other ladies recreated! Wonderfully bright colors. I've yet to try roses but really want to!